On May 17, 2014, students in form five and upper sixth graduated in splendid robes donated by Ex Saker Students Association (ExSSA), USA. 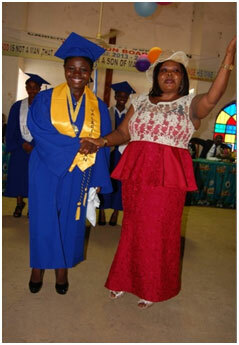 When adorned with graduation robes, girls feel the sense of pride in accomplishment and the confidence to continue on the path of excellence. 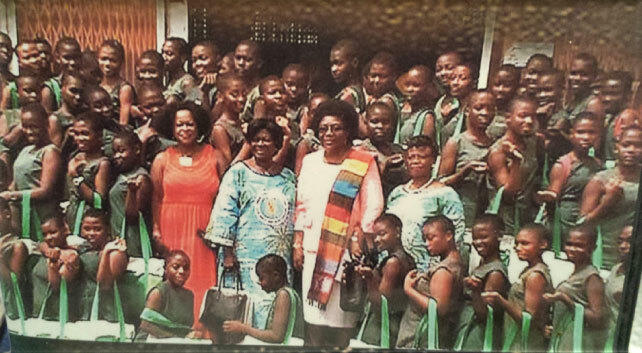 For this reason, members of the organization under the leadership of its current president, Ms. Sara Bame-Kum, quickly rallied resources to fund new robes for more than 700 girls. To understand the symbolic significance of this gift is to understand the place graduation robes hold in the identity of Saker Baptist College. When the pioneer students donned their white graduation robes in 1966, a tradition was born. 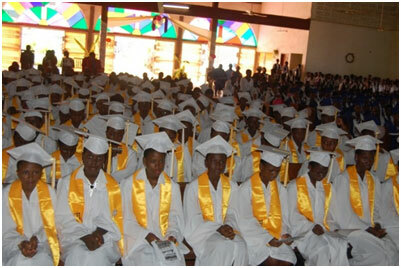 Saker Baptist college did not only become the first secondary school to institute the wearing of graduation robes in Cameroon, these robes became one of the recognizable features of the school. 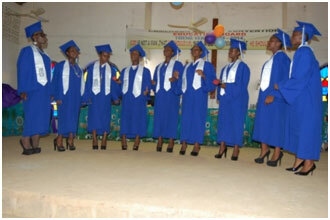 If there’s one material keepsake from Saker Baptist College which embodies a girl’s pride of attending this school, it is a graduation day photograph in the empowering robe. 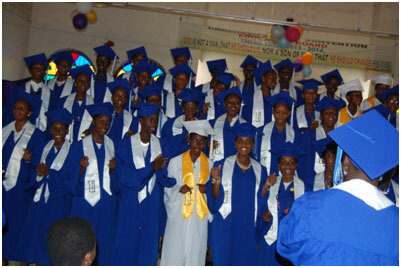 Yes, these graduation robes became a source of pride and served as inspiration to younger students, who worked hard to get to form five so they could match proudly on stage in their graduation robes to receive their certificates and also take memorable photographs with family members. Consequently, when the fire incident of February 1976 in Saker Baptist College burned graduation robes, it became a traumatic and indelible experience in the annals of the school. 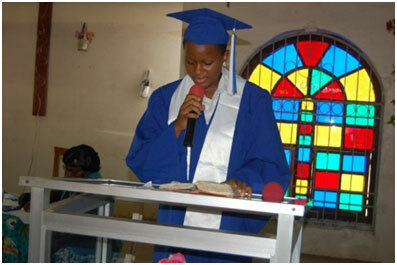 That year students had to graduate in make shift pink dresses and not the celebrated white graduation robes. 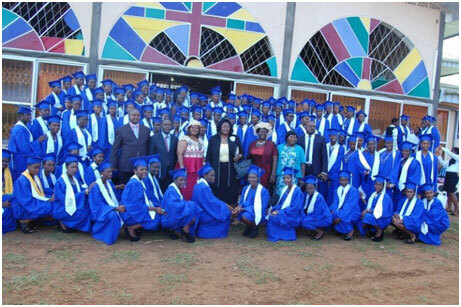 In Saker Baptist College, wearing graduation robes is much more than an academic tradition; graduation robes remain a signpost of our dynamic beginning and a visible part of our fabric of excellence. 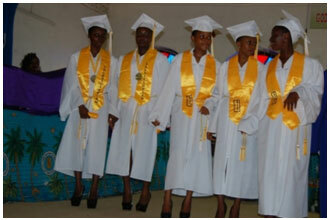 To embellish the tradition of graduation robes, ExSSA-USA introduced the sash with the new robes, white for Upper Sixth and Gold for Form Five. 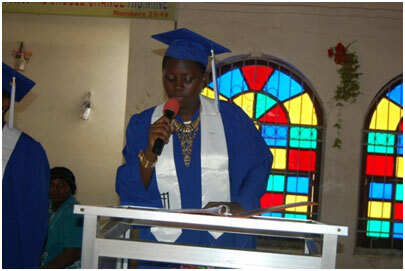 Introducing the designation of a valedictorian and salutatorian gave the award ceremony a new flavor and tradition. Continuing in its effort to empower girls, ExSSA USA, in addition to scholarships recently awarded,donated school supply kits to 216 girls in graduating classes at Saker Baptist College, Limbe, Cameroon. Working through its member at large (MAL) Chapter, the organization brought smiles to 216 girls, who saw the donation as an encouragement to complete secondary education and offset school expenses. ExSSA USA recognizes that the young girls at Saker Baptist College especially those from low income families lack basic school supplies due to the heavy financial burden their parents and guardians carry in trying to pay their tuition. Lack of basic school supplies can lead to a challenging environment which may directly lead to failure, thereby ending the road to quality education. ExSSA USA has identified this gap and is intervening through the provision of school supplies kits ranging from school bags, notebooks, highlighters, pens, pencils, first aid kit, a planner, umbrellas, etc., to offset other school expenses. In this noble effort, the graduating classes were strategically selected because they will be taking the exit GCE exams at the ordinary and advanced levels at the end of this academic year. Proud recipient of a Kit being interviewed. She predicted a 100% success rate all round for Saker this year. 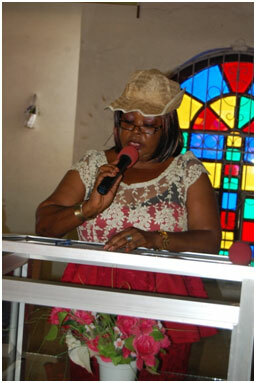 EXSSA-USA President’s Speech that was Read to the Students of Saker Baptist College by Ms. Ngaaje. You are assembled here today to witnesses the generosity of people you have never met, but who feel compelled to empower you to succeed at school. These people know that when you succeed, your families will succeed. And when your families succeed, we will have better communities and a better nation. They know this because we, Sakerettes, are talking about you and your future to them. A few years ago, we were students at Saker facing most of the challenges you face today, if not, more. Like you, we were girls in uniforms with big dreams and small wallets. Among us, there were rich students who had everything, and poor ones whose parents barely struggled to pay their fees so that they, too, could have a good education. These poor girls struggled through the school year often begging for extra supplies from those who had more. We remember these girls and recognize that even today Saker admits students who struggle throughout the year with supplies or school fees. Our exposure to tools that would enable you succeed in school and catapult you to powerful leaders, is the impetus for this school supplies drive. We recognize that getting to form five or upper sixth is not by chance. Rather, money, hard work, and the determination to be responsible women with great potential to impact your communities brought you this far. To crown this success, to instill confidence in you, we provided graduations robes last summer so that you would truly stand tall in your accomplishments. Even as you forge ahead, there are many girls your age who are already married or cannot afford to continue their secondary education because their parents do not have the money, even for the basic supplies in your packages today. Most of you present here today are proudly 15 or a little over 15. I want you to take a moment to imagine yourself as a mother with children and no money to even access basic health checkups; imagine that you were one of the women you see on the streets begging for money to buy a spoon of palm oil. Imagine that you, this woman who cannot afford palm oil also has children who desperately need education. Among her children they are girls like you, who will be mothers tomorrow. We, Sakarettes, think of all these things and the caliber of women we want you to become. We know that only by advancing your education will you overcome challenges faced by a majority of Cameroonian women to make meaningful contributions to your communities and the nation. We are investing in your education so that tomorrow you will have the economic power to invest in your children, families, and communities, and together, build a strong nation of women committed to growth and prosperity. Even at 15, you can start advocating for issues that impact other girls around you because you have earned an education and the right to do so. Do you know that when you go home on holidays, you could actually help another girl learn how to read or teach them how to write? If you do this every holiday, you will educate more girls and give them the power to make good decisions for themselves just as you do. Share your knowledge! Don’t be afraid to talk to other women and ask them to join you. There’s a whole world of possibilities out there, opportunities for you to change someone’s life and be a leader. Look to Malala, a teenage girl and the youngest recipient of the noble peace price. May you acquire the spirit of the men and women whose generosity makes it possible for you to receive these supplies today; may you be inspired by these supplies to work hard and reach your highest goals. And when you can, go to www.exssa-usa.org. and say,”thank you” to the hundreds of women committed to advancing your future.